Now I'm officially scared. WHOA. BIIIIG SPIDER!!! Poor bird. What will they be eating next? Pet hamsters? Little dogs (like that snake forever ago)? AHHHHHH!!!! Fear the spiders!!!!!! Okay, I did not need to see that. I already suffer from arachnophobia! That totally did NOT help! "one lucky spider...." gross. I would never study spiders. i need help for my story again. how do you clean a horse stall with bunches of poop and mud. Anonymous: I believe (and someone correct me if I'm wrong) that they keep hay in the stalls to absorb everything. Then when the hay gets to dirty, they remove it (using a pitchfork) and replace it with new hay. This sounds like a fabulous story. Horses and juvenile delinquents are always a good mix. i'll send you a copy of the book once it's published (if i ever finish writing it). thanks. KSITSC & Anonymous: Yeah, that's right. My great-aunt used to have a horse, and that's what they did. Oh my gosh! Poor bird!!!! It's so painful seeing a dead bird/animal or see it being killed. Hey this is actually quite gross but I actually saved a mouse from my cat's mouth. NO! I did not touch it. Not a single touch (egh). But I scooped it into a box and threw it down the drain. I don't want my cat being dirty, he's like my best friend. Oh, one night, I went through the back door to go to the front yard 'cause the cat's were fighting. I was actually running with a torch when BOOM. I stopped suddenly because in front of me there was a huuuuge web with a huuuuuuge spider in the centre. If I had taken one more step, I would've been in there. Yuck! Once again, what do you call someone who's scared of spiders? Poor bird. I do like spiders though. Call me heartless, but I'm not very sorry for the bird. 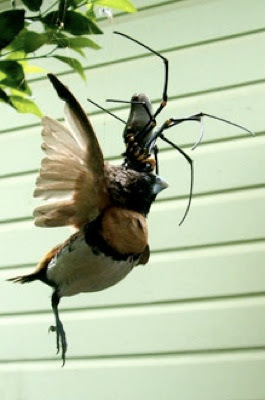 I'm more sorry for the people who have that monster spider in their backyard! Ugh! BIG SPIDER! I'm never going to Australia, ever! anonymous with the horse stall question; there is always the option of laying down hay in order to keep it easy to clean up the poop. I use cedar chips though, like you would put in a hampster cage, except a little more coarse. I find that this absorbs everything better, and it lasts longer. When you throw the poop out with the pitchfork, a lot of the hay gets thrown out as well, and this can get to be pricier than the cedar method. However, since you are just writing a story on it I would use Kirsten's way just because it is a more common one, and would be recognized easier by the audience you are writing for. But spiders are definitely my favorite creepy-crawlies because of their webs. Cockroaches terrify me, though. I'm w/ you on the spider fear. fondog one in my room can be practically life threatening. when i saw this, i think i almost went into a coma! not to sound like a toatal girly girl or anything, but we all have our fears, right? Written Chaos: Ha ha! Same here! Except that I like cochroachs. I have saved many from heartless people who think it's fun to squash them. But I can understand.